I just love blues and greys together, and it gave me an idea to use a new stamp set and paper that you will be able to get in January! 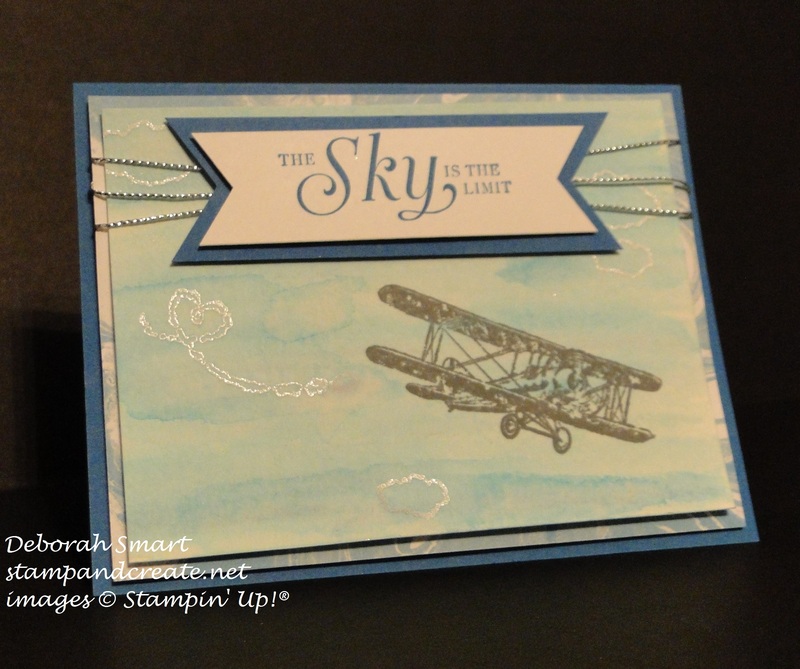 Actually, the stamp set Sky Is The Limit can only be earned as a FREE item during Sale-A-Bration. I just love the old fashioned biplane, and the clouds! The script font is just lovely, too. I started with a piece of Watercolour Paper, and used my Aqua Painter and Pacific Point ink to paint a sky background. After it was dry, I stamped the clouds in Versamark Ink, then heat embossed them with White Embossing Powder. I then stamped the plane in Basic Gray Archival Ink. The sentiment was stamped onto Whisper White cardstock in Pacific Point ink; I then used the Banner Triple Punch for the ends on it as well as a layer of Pacific Point cardstock. I wrapped the Silver Cording Trim 3 times around the top of the card, before layering this panel onto a piece of Perfectly Artistic Designer Series Paper – also FREE during Sale-A-Bration. This paper is gorgeous; one side is a fabulous marbled effect in 6 different colours. The card base is of Pacific Point cardstock. If you like this stamp set and DSP, you’ll have to earn them quick – this year, some SAB products are only available from January 5th – February 15th, then other SAB products will be introduced! So you won’t have that ‘oh, I already earned it all’ feeling – you’ll have more choices after the first 1 1/2 months! I hope you’ll join in this Watercooler Challenge – head over & check out the other designs for inspiration, then post your own creation! It’s always fun, and challenges are a great way to get your creative juices flowing. If you are in the area, and would like to receive a copy of the new Occasions Catalogue and Sale-A-Bration brochures, just leave me a message & I’ll take care of it. You can order the products used to make this card (with the exception of the SAB products) by clicking on the pictures below, & you’ll be taken directly to my online store. Previous Previous post: Sneak Peek – New Occasions and Sale-a-bration! Hi Deb, that bi-plane is my favourite among the Sale-a-bration stamps. What a lot of fun you’ve had with this card! 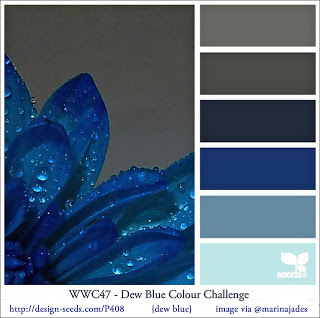 You’ve used Marsha’s blues with a variety of mediums, from cardstock to ink to watercolouring. Love it! And that Perfectly Artistic Designer Series paper really does pull the layers together with its marble effect. Thanks so much for joining us this week for the Watercooler Wednesday Challenge. Deb, beautiful card. I like the banner at the top, which works so well with that plane! You did a spectacular job on the watercolor sky, too.Thanks for joining the watercooler challenge!